I’m loving the Olympics so far, but I can’t figure out why world records continue to be broken so often. As beating previous records increasingly becomes a game of milliseconds, surely it should get ever more difficult and rare to see records broken. Yet it seems like every few swimming events new record is set, and the athletics stuff has not even started yet. Where will it end? Then there’s one Olympic event that dominates all others, the most basic physical competition imaginable: the race to see who can run faster than anyone else in the world. I made this chart to understand the progression of the record over time. You can see it took about fifty years for humans to get half a second faster at running a hundred metres. Even that’s underselling it: it took fifty years for just one human to run that much faster just once. But most amazing of all is the magnitude of what Usain Bolt has achieved. 2008, boom. 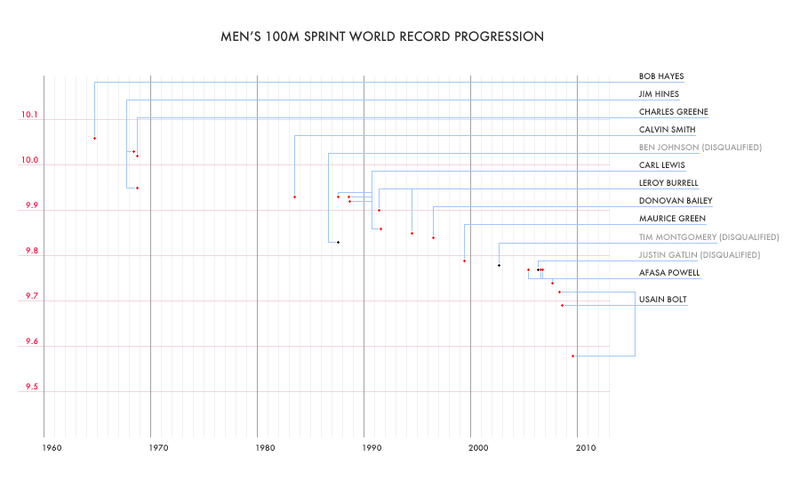 The timings simply drop off a cliff when they reach him, blowing almost two tenths of a second off the difficult end of the record, and single-handedly making over a third of all progress since electronic timing was introduced. There are some other interesting details to be spotted: Charles Greene held the record for a single day before Jim Hines took it from in Mexico ‘68. Hines’ time that day went unbeaten for over fourteen years. Ben Johnson’s infamous win sticks out a mile; nobody would beat his chemically-enhanced run for more than a decade. Will Bolt keep hacking away at the record? We’ll find out before the men’s 100m final tomorrow afternoon.